Designed for a single lot, House 2 creates private outdoor living space by orienting the primary interior spaces around a central courtyard. To maximize the courtyard dimensions, the surrounding structures are placed at the edge of the required setbacks. The garage and 2nd-floor guest rooms form the east side of the courtyard, the living spaces and master suite form the west side and the core elements (stair, elevator, and mechanical) form the north side. A one-story wall along the south side provides privacy and permits south light to enter the space. To enhance the courtyard’s relationship to the site, the interior living spaces along the waterway are elevated. A glass enclosed stairway descends from the living and dining room above to signal the entrance from the courtyard entry. The extension of the swimming pool from the courtyard to the rear yard further enhances the expansion of exterior space. Large terraces along the south side of the 2nd floor’s living room and the 3rd floor’s master suite provide ample exterior living space with views of the courtyard and canal. 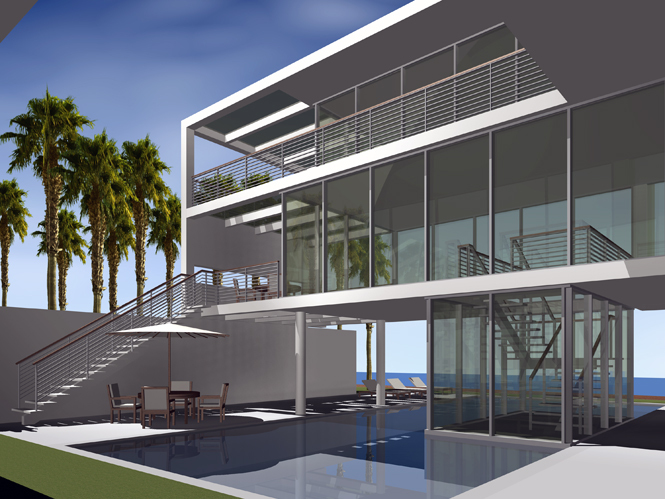 Additionally, an elevator accessible rooftop terrace and entertainment space accompany the third floor’s master suite.